After teaching cooking online and in-person, Morrison takes her culinary skills to the small screen. CHRISTIE MORRISON HAS BEEN teaching people how to cook for eight years. During her time at America's Test Kitchen, she's been a member of the books team, a senior editor for Cook's Country, an instructor in the America's Test Kitchen Cooking School, and an editor of special projects, such as America's Test Kitchen's cooking shows aboard Holland America Line. She's also taught cooking classes at The Cambridge School of Culinary Arts. Now she gets to add "on-screen test cook" to the list. Here she talks about her affinity for Pennsylvania Dutch cuisine, her background in teaching, and the dish she likes more than she ever thought she would. The town I grew up in was rich in Polish and Italian food culture, although my mother cooked recipes that aligned more with the Pennsylvania Dutch influences of her town, a rural farming village just 12 miles away. My mother and grandmother both cooked, although to be honest, very little of my interest in cooking began at home. I did draw from experience, however, when I developed my Cook's Country recipe for Pennsylvania Dutch Chicken and Corn Soup. My nana used to make it all the time, and the smell of the soup always takes me back to her kitchen. My best friend's family was Polish and Italian, though, so I developed a great appreciation for things like pierogies and haluski from days spent at her house. Host Bridget Lancaster and Christie share a laugh while filming a segment for season 10 of Cook's Country TV. There was a lot of great pizza in my hometown—all mom and pop joints. We didn't have Pizza Hut or Domino's, but there was a sandwich shop right around the corner that got a lot of business from my family when I was growing up. Pierogies are probably the other favorite dish. We'd have them in school on Fridays (since much of the area was Catholic), smothered in butter with cabbage and onions. Many of the churches would hold fundraisers of homemade pierogies each year, too. Cook's Country taps into the nostalgia of cooking. How much has the place you're from impacted the way you cook? Pennsylvania Dutch food culture employs a lot of sweet-sour flavors and pickling...I think that might have been the biggest influence on what I like to cook at home. I always have pickled onions and jalapeños in jars in my fridge, ready to be deployed on a salad, sandwich, summer roll, or taco. Whenever I have extra produce, my first instinct is to pickle it: fennel, carrots, green beans, even apples! On-screen test cook is only one title you hold at America's Test Kitchen. Can you speak a bit about your day to day? My primary job is Editor of Special Projects at America's Test Kitchen. Right now that means my focus is our partnership with Holland America Line. I create the curriculum for the onboard cooking shows and workshops across the fleet, as well as training the instructors who teach the classes onboard. I get to visit the ships from time to time to observe classes and instructors; so far I've been to Hawaii, Vancouver, and the Eastern Caribbean—definitely perks of the job. I also teach classes for our Online Cooking School and work on other business partnerships as needed. 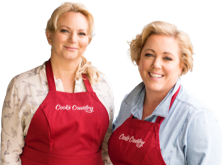 What do you love most about the Cook's Country brand? I love the stories we get to tell with Cook's Country. Regional foods say so much about an area's culture. I was able to travel to the Mississippi Delta several years ago when I was researching Delta Hot Tamales. My visit had a profound effect on me and how I viewed the recipes I was working on day in and day out. The people I met in Greenville were quick to share their experiences and recipes and immensely proud of their food heritage. It made me strive harder to make my recipes as authentic as possible. What's your favorite part about being on the Cook's Country TV show? I really enjoy teaching. I've taught cooking classes since I graduated culinary school, and I taught high school English before that, so teaching recipes as part of the Cook's Country TV show seems like a natural fit for me. What was your favorite recipe segment to shoot for the 10th season of Cook's Country TV? I loved making the So-Cal Churros! They're such a fun project and the reward is well worth the effort. Christie teaches host Julia Collin Davison how to prepare our recipe for So-Cal Churros. Fried catfish—I didn't think I'd like it, but then I had the catfish at Taylor Grocery in Oxford, Mississippi and found out it could be really flavorful, especially with a side of comeback sauce! Strawberry Pretzel Salad and Backyard Barbecue Beans. No question. I'll be the most popular person there. I'd hit up Austin, Texas and eat at Franklin Barbecue: meat, meat, and more meat. I'd eat shrimp and grits in Charleston, SC. I'd definitely stop in San Francisco/Berkeley, CA. There are too many places there to count, but Chez Panisse and the French Laundry would be among them—great produce and lots of wine. I'd go to Seattle, WA, and eat at any of Renee Erickson's restaurants for oysters and wine. Then I'd finish in New Orleans, LA, where I'd indulge in all sorts of Cajun and Creole dishes like étouffée and jambalaya.